Soybeans slipped lower on low volume. Corn was unchanged on low volume. Wheat traded higher also on low volume. US Dollar was higher. Crude was higher. There was talk that US may avoid another partial government shutdown. Soybean and most commodity prices are on hold until more is known about US and China trade deal. There remains hope that eventually a deal can be reached. There is also hope the deal will include China buying additional US farm goods. 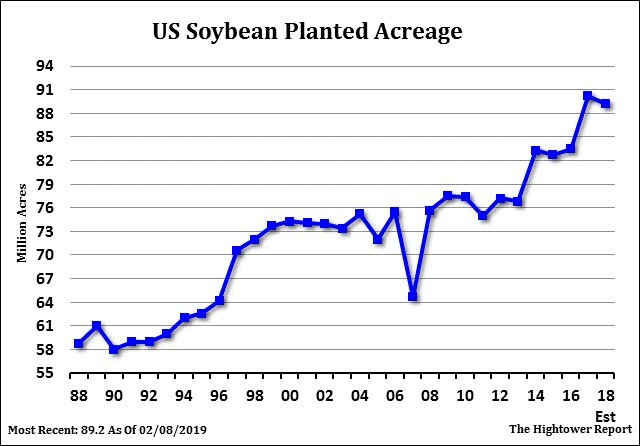 Given the approaching South America harvest some doubt China will come in and buy additional US soybeans over the 10 mmt they have bought to date. Latest CFTC Commit of traders report suggest managed funds are small net longs in soybeans and soymeal and net short soyoil. Avoiding the shutdown could suggest USDA will have the Annual Outlook Conference next week. Some hope that their estimate of US 2019/20 supply and demand will give market some new price direction. Corn futures were unchanged. Trade continues to hope for a new US and China trade deal. 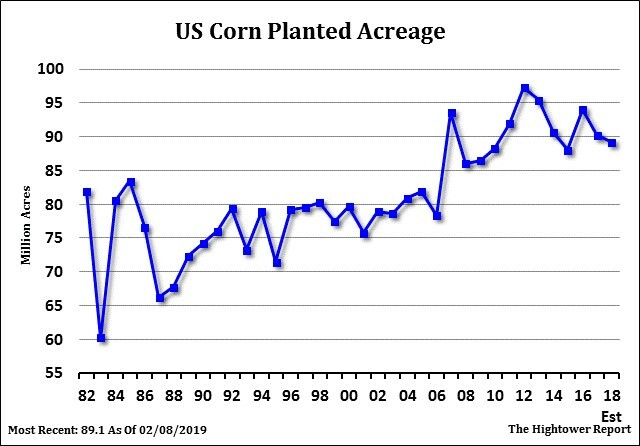 There have been rumors that China has been asking for US corn prices. Countries like S Korea and Mexico remain active in buying US corn. US cold weather is slowing cash movement which is helping the domestic basis. Weekly US ethanol production was up from last week and last year. Stocks were down from last week but are still above last year. Margins remain negative. Ethanol futures have bounced off the January lows. There is some hope that a new China trade deal could include China buying US ethanol. CFTC commit of traders report is slowly catching up. Latest report showed the managed funds not as long as much corn as expected. Avoiding the shutdown could suggest USDA will have the Annual Outlook Conference next week. Some hope that their estimate of US 2019/20 supply and demand will give market some new price direction. Wheat futures saw some short covering. Wheat futures remain in a trading range. Drop in 2018 supplies offers support near season lows. Estimates of higher World 2019 supplies limits the upside. US cold and wet Midwest weather may be helping US domestic cash basis. NWS 6-10 day forecast calls for another shot of below normal temps to move across most of the Midwest and plains. 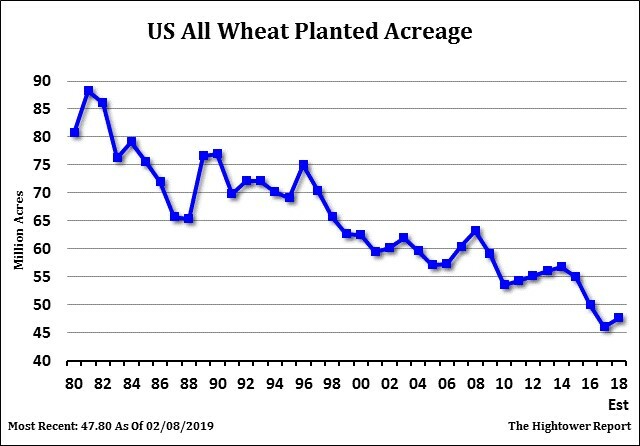 This could continue to challenge cash movement logistics and raise concern about stress on part of the US 2019 winter wheat crop. CFTC commit of traders report is slowly catching up. Latest report showed managed funds net short wheat. Avoiding another US shutdown could suggest USDA will have the Annual Outlook Conference next week. Some hope that their estimate of US 2019/20 supply and demand will give market some new price direction.